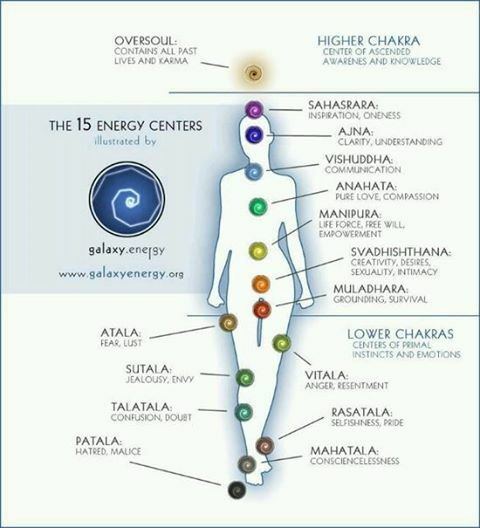 Anybody knows how to activate chakras below root chakra?I heard they are very good tools for maintaining of physical health. Oh I didnt realize this question was posted for Kurtis Joseph. Im sorry. But anyway thats how I do mine too. No worries @arianna all insight is greatly appreciated. I have not gone over this yet within the work upon the Path of Smoke. These chakras are actually quite dangerous to activate when unprepared as they connect to the primitive nature of the human condition. However at the correct time and with the proper approach these can increase vitality and vigor and connect you to the unlimited potential of the void through the nexion of the eternal God self. I will go into much more depth within the next text in regard to this, however activation of these is not our goal within Kunda Yoga. This is way too complex to get into here at the current time. This is the point where we have devoured God and the false divine light to merge re-unite it with the darkness of the void through the nexion of self. This can be effectively done once the state of Kunda is achieved. (this is reflected in the fact that these chakras are of a dual nature with one chakra being in both legs.) These are the aspects of nightside consciousness and the primal beast that man initially was and in many ways still is. Once the Kunda Force has risen we then absorb the negative aspects of self with the darkness of the void to become more refined and evolve so we can direct these energies toward our ascent. If you are asking about this… I would not now concern yourself with it. These things are the stuff mass murderers and psychopaths are made of. Is it possible to open up all the chakras all at once. Honestly idk…i know once they are working properly they are. I think @KurtisJoseph, might be better able to answer that question. Listen ladies and gentleman… do not misconstrue this with fueling the chakras with Kundalini. We give no fucks about the chakras. The chakras are isolated and constrained aspects of the unlimited possibility and potential of self refracted through the colors of the illusory false light spectrum. We focus on the Kunda force and the kunda force alone and we use it to devour the limitations of the chakras. The chakras are the bars of the prison. These are torn aspects or levels of consciousness which were once whole before the tyranny of the limits of creation. We devour the limits of the chakras to re-unite these isolated levels of consciousness so that we can become whole and liberated on this corporeal plane of Ahura Mazda. Through the process we defile his creation by manipulating and circumventing the intent of limitation for the sake of imposing our individual transmutation and will upon this plane that it may align more with our divine potential. I truly love you guys… but this is why I wrote the book! LMAO! I do… I love you. Your questions are cherished. Look around though and explore my section of the forum as much of this is already answered. Ford associates the Divs or patrons of my book with the chakras. It does not work in the context of the Path of Smoke. He accepts the Zurvanite apostacy… I reject it because Ahriman rejects it. These are not mere atavisms. These forces make themselves objectively real extremely fast. Here is one reason I reject the whole chakra stimulation thing. Give this article a read. It is all in my book as well but if you do not have it, it supports what I am saying. The chakras and kundalini/kunda force are not mutually dependent as taught today. No, they are mutually exclusive. Well that is the purpose of Kunda yoga. Oddly any time I do myofascial release on any of those lower points I get an outpouring of what’s there. Would be nice to circumvent all of that and go back to how I felt energetically as a child while living from the highest wisdom possible.